Bake a two-layer 8 inch round cake. Ice in white buttercream icing. Using black icing and round tip size #5, pipe on the spider web using the picture as your guide. Extend the spider web over the sides of the cake also. 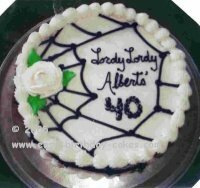 Reserve space on the top of the cake for your message (such as Lordy, Lordy, Albert's 40 in the above picture). Write the message using the same round tip. Make the rose with white icing and rose tip size #127. The leaves are made with green icing and leaf tip #366. For some fun party favors that would go great with this cake, check out these over the hill candy wrappers . You can personalize them to match whatever your message is on your cake.